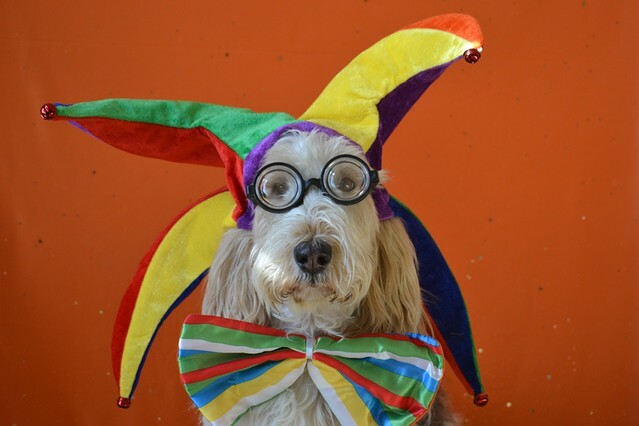 Interested in teaching your dog circus tricks? Think your pooch has what it takes to learn how to perform? There may be more to it than you think. Some aspects of circus training for dogs are simple. But it is necessary to start preparing your dog slowly and early. They all learn at a different pace. Bond with your dog. Hopefully you have done this already by default. This should be a priority, even if just to show your dog love. However, bonding with your dog is one of the best ways to ensure your dog is loyal and listens to commands. If your dog has not bonded with you, he or she may not feel there is a reason to listen to commands. Teach starter tricks to your dog first. Before advancing to more complicated tricks, such as those your dog could perform in a circus, start with the basics. Start with tricks such as jumping up onto objects only on command, standing, spinning, laying down flat, and staying without the stay command. These will get your dog prepared for the more advanced tricks that use these commands along with added steps. Practice starter tricks every day. Once your dog learns a trick, you should not stop practicing the trick with your dog. Most dogs will enjoy repeating the tricks daily and this is necessary to keep them in memory. It isn’t necessary to practice every single trick every day, especially once your dog knows many. But be sure to get in practice for every trick as often as possible – and at least some tricks every single day. Make learning enjoyable. The point of teaching your dog tricks is not for him to serve you. It should be an enjoyable process for your dog as well. Most dogs love to perform for their owners and many love an audience as well. If you make the process fun and don’t stress over the time it takes to get each trick down, you’ll have a happy and well-adjusted performer. That always makes for a better show than an animal who needs to be forced – and you should never force your dog to perform any trick. If your dog is not having fun, give your dog a break and consider what you may be doing wrong. Get your dog used to large crowds. A dog with stage fright is not going to perform well. Also, not all dogs who love people will love doing tricks for a large crowd. Start small by having your dog perform on a kitchen table for the family and work your way up to backyard shows, park shows, and more in preparation for larger crowds. Not only should your dog thrive in a large crowd, but he should also know when to play with people and when to put on the show. You can teach your dog this lesson with practice. Never let anyone interact with your dog during a performance unless it is part of the performance. *Hit that subscribe button over to the right or you might miss out on more clown fun!